Everyone knows that going through a divorce can be a very stressful and traumatic situation. One of the most difficult obstacles to deal with during this time is the home that you and your spouse bought while you were married. Most likely when you both signed the loan documents, you mutually agreed to repay the loan until the debt has been satisfied. This is a document that transfers any interest an individual has in a property to another. This deed can be used to transfer interest from one spouse to another, but it is important to remember that it does not eliminate the liability for the associated debt. These deeds can are also used in a divorce situation. 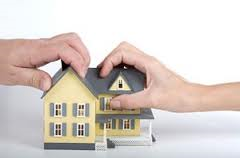 This allows the transfer of interest from one spouse to another and also changes community property into separate property. This process if very similar to the Quitclaim Deed. You will need to sign these together with a notary. It is also a great idea to hire an attorney to make sure all of the paperwork is correctly filled out. Probably the easiest and most effective way to get both you and your spouse’s names off the mortgage and to also remove liability from the debt is to sell your home. Selling your home can pay off your existing mortgage and then any of the leftover money can be split between you and your spouse. In addition, it is probably more convenient to try and sell your home before your divorce is finalized to cut down on any discrepancies that may arise. Another very effective way to remove one’s liability from the mortgage is to have one spouse refinance the mortgage into his or her name. This will allow one spouse to remain in the home. Typically, the spouse that wants to keep the property will then pay off the other spouse’s equity share while refinancing the loan into solely his or her name. This is one option that is very rare because not all mortgages are assumable, and even if they are, many lenders tend to be hesitant in going this direction. You will need to call your servicer and find out if this is a possible option. If the mortgage lender will allow you or your spouse to assume the loan, you can begin the process by completing an assumption agreement and a release of liability. If you find yourself in this situation and need some clarification on your options with your home, please contact me and we can go into more detail on what you may want to do.